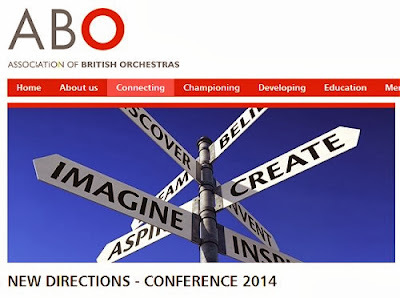 This year's Association of British Orchestras conference has the stirring theme of New Directions 2014. The conference is presented in conjunction with Classic FM, and yesterday's key note speech by Paul Morley is available exclusively on the Sinfini Music website which is owned and controlled by Univeral Music; coincidentally classical music superpower Universal Music also supplied last year's key note speaker, their ceo Max Hole. Tonight the delegates will be at the "elitist" Barbican Hall - Max Hole's description not mine - to enjoy Brahms and Walton with a dash of Maxwell Davies played by a leading London orchestra under a titled conductor. After which the great and good of British orchestras will doubtless return home preaching the gospel of change. New directions anyone?